Partners, Buddies, Pals… at least, onscreen. 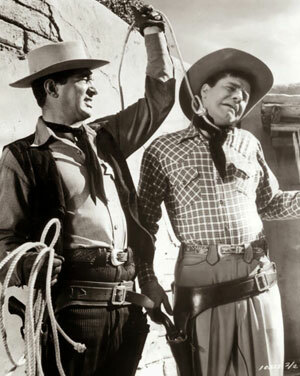 Jerry and Dean in the Wild West! Years Pass… We meet Wade Jr. (now young Lewis, 30 at the time), a coddled rich mama’s boy in a mansion, who dresses in splashy cowboy duds and rides a mechanical horse, fantasizing about riding high in a saddle that would probably give him vertigo, while his butler looks on; who accedes wimpishly to the wishes of his overbearing mother (Agnes Moorehead as Mrs. Kingsley) to marry a wealthy girl that terrifies him. Enter Slim Jr. (young Martin, 39), a strapping cowpuncher with Lori Nelson as his token girlfriend (equals masculinity), beseeching Mrs. Kingsley for a loan to save a ranch out west – the very ranch that Slim (his father) and Wade (Mrs. Kingsley’s dead husband) defended years ago. Mrs. Kingsley now owns shipyards and steel companies – how she made her fortune is not shown – yet turns Slim down, not wanting any connection to her western past. However, Wade, enamored with Slim’s rugged cowboy ethos, secretly withdraws his savings and runs away to help Slim, partnering with him to save the ranch of their fathers. And who is trying to run them out? The son of the original raider – Sam Hollis (John Baragrey, who also played his father Dan in the opening scene), but – much like the writers of Superman discovered that Lex Luthor could do more damage as a CEO than a generic crook – Sam is not a bandit, he is the town’s bank manager! To disguise the fact that Wade is the heir of the Kingsley ranch, Slim dubs him “Killer Jones” (which also disguises the fact Wade is a city slicker with no horse, rope or gun skills). Through Hollis’s machinations, the town makes Wade the sheriff, so that Hollis and his gang (featuring Jeff Morrow as Rio, and Lee Van Cleef and Lon Chaney Jr. in the deep background!) can run roughshod through the county without being bothered by anyone competent. 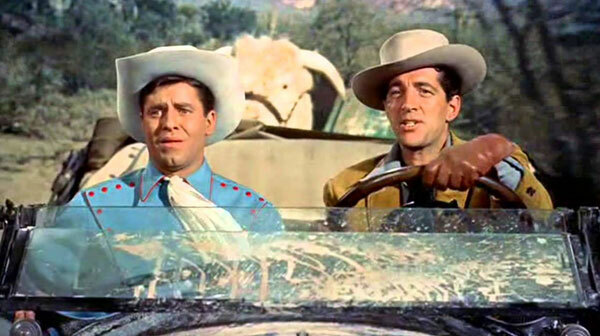 Based loosely on Bing Crosby’s 1936 RHYTHM ON THE RANGE, PARDNERS is Norman Taurog’s 6th and last directorial effort for Martin and Lewis, Sidney Sheldon’s 2nd and last screenplay for the team. We gotta admit that though Jerry was the better gun handler, Dean looked mighty comfortable in that cowboy getup. That western swagger would serve him well in his upcoming solo career (RIO BRAVO, 4 FOR TEXAS, et al). In a blue outfit that almost looked like a onesie, Jerry was looking kinda portly – not fat, but definitely eating well, compared to his boney carriage from the early films. Dean’s girl, fragile-petite Lori Nelson, was not helping, standing next to Jerry with her frame so slight you could wrap your palms around her waist. Maybe it quelled the breakup rumors for the innocent, breezy public of the era (who did not yet have access to that virulent, seething wreckage of society called social media), but looking back on that message now, we have to wonder what was in both their heads at the time. Surely at this point there was some inkling of their termination date, or at the very least, Dean planning his exit strategy? These guys were THE kings of the entertainment circuit, and an army of personnel were about to be either out of work or transferring their energies to other clients. Writers: Sidney Sheldon, Jerry Davis, Mervin J. Houser. Starring: Dean Martin, Jerry Lewis, Lori Nelson, Jeff Morrow, Jackie Loughery, John Baragrey, Agnes Moorehead, Lon Chaney Jr., Milton Frome, Lee Van Cleef, Jack Elam. … was Jerry Lewis. Astounding as that may be to believe, Jerry, in his prime, was the fastest quick-draw this side of The Man With No Name. Yet if you think you’ll see Jerry perform magnificent gunplay in PARDNERS, there is just a small gun-spinning taste in the final minutes. His character is an inept cowboy, so for most of the film he can’t display his gunman skills. 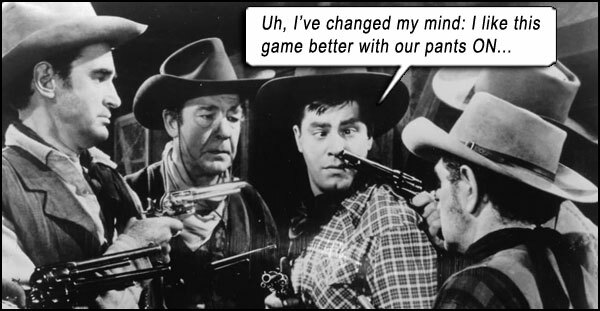 So it’s strange that real life Jerry would become that fast with a gun when he was not renowned as a quick-draw hero – matter of fact, there are ZERO movies where he plays such a character. So it was merely an avocation for him to become so proficient!